Champion’s full line of compact Commandair reciprocating air compressors are manufactured to the same quality standards as our larger, industrial models. These packages are sized for smaller air requirements such as small industrial plants, schools, small automotive centers and do-it-yourselfers. Cast iron cylinders for holding rigid tolerances and ensuring high compressor efficiency. Lightweight aluminum alloy pistons ensure proper reciprocating balance. Two compression rings and one oil-control ring are used for better oil control, less air blow-by, and higher efficiency. High density, high silicon die-cast aluminum alloy connecting rods minimize reciprocating weight and help promoted exceptional compressor life. High-quality Swedish Steel reed-type valves provide long life. Tapered roller bearings on two and three-cylinder models provide offer premium low friction movement for minimized efficiency. Precision balanced flywheel has fan blades for maximum compressor cooling resulting in cooler compressor operating temperatures. Rugged ductile iron crankshaft has large diameter throws for minimum bearing loads and counterweights to minimize vibration. 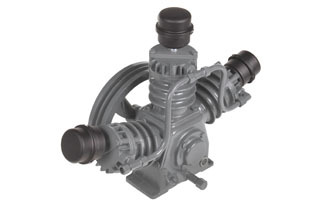 Rugged cast iron crankcase designed to rigidly support the crankshaft and bearings. Convenient oil level sight gauge on 2 and 3 cylinder models. Removable cartridge-type intake filter features a 10-micron rated element.